At SOLIDWORKS, not only do we focus on creating great products, but we invest significant time understanding and nurturing engineering and product ecosystems. SOLIDWORKS ecosystems take the complex interactions between several disciplines such as design (MCAD and ECAD), manufacturing, service, quality, supply chain, marketing, inventory, and end customers into account to deliver best-in-class and easy-to-use process solutions impacting business outcomes for our end customers. We build ecosystems to improve business outcomes like accelerated innovation, expansion into new markets as well as multiple product lines, digital sales, and profitability, just to name a few. With SOLIDWORKS 2018, we are addressing four ecosystems that customers can leverage right away: Design to Manufacturing, Data Management, Simulation and IoT. This blog post will discuss the products in each ecosystem and how they were created to form a whole that will build your bottom line and accelerate innovation. At SOLIDWORKS we started with building the design-to-manufacturing ecosystem with the launch of Model-Based Definition (MBD) and SOLIDWORKS Costing. MBD is transformational in reducing manufacturing errors, accelerating design to manufacturing, and reducing communication gaps. It is the digital thread in a company that connects manufacturing to design where both stakeholders can help make designs better. Many large companies are implementing MBD to bring design and manufacturing closer than ever before. SOLIDWORKS Costing brings manufacturing thinking upfront into the design cycle. SOLIDWORKS Inspection helps connect inspection data on manufactured parts to design by automating the process. With SOLIDWORKS 2018, we are launching SOLIDWORKS CAM as a product and in a process called ‘SOLIDWORKS SMART Manufacturing.’ Packaging and pricing will be disclosed during the SOLIDWORKS 2018 launch. SOLIDWORKS CAM is disruptive for two reasons: it will feature both tolerance-based machining and Intelligent Knowledge Base. Tolerance-based machining reads the information from SOLIDWORKS MBD and intelligently figures out the machining operations necessary to manufacture the part. This goes above the base level (step 0) of feature-based machining. Intelligent Knowledge Base learns your manufacturing behavior and intelligently adapts future manufacturing jobs to your preferences. More than 200,000 SOLIDWORKS users use SOLIDWORKS PDM to manage their data. This number of loyal SOLIDWORKS PDM users is a testament to the product’s intuitiveness, ability to manage without overhead, CAD integration, ease of implementation and effectiveness at providing a return on your investment. With SOLIDWORKS 2017, users of SOLIDWORKS Professional and Premium have PDM Standard for file management. Moving from the included PDM Standard to PDM Professional is a simple switch – there is no need for new implementation or arduous processes. SOLIDWORKS PDM manages all products in the SOLIDWORKS portfolio including SOLIDWORKS Electrical (PCB is in the works). 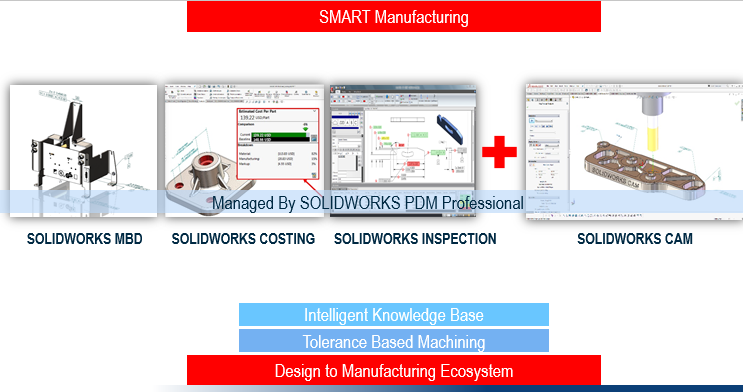 This is one of the key components of ecosystem thinking – SOLIDWORKS PDM managing all parts of our customers’ processes. With SOLIDWORKS 2018, we are introducing SOLIDWORKS Manage. This product enables you to conduct Project and Process Management, Item Management and create dashboards and reports. 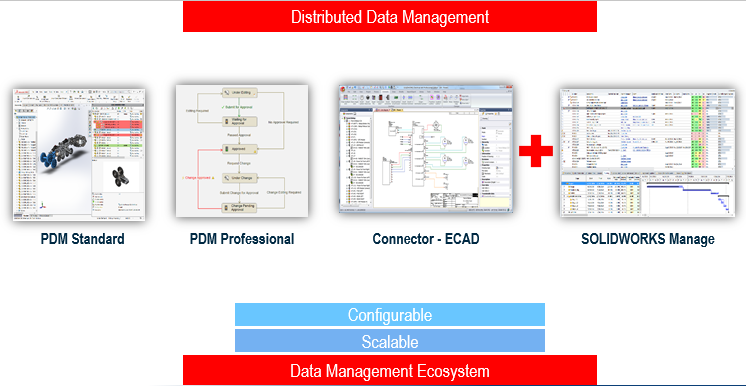 For customers who cannot implement PLM systems, SOLIDWORKS Manage and Distributed Data Management is a game changer. More details on pricing, packaging of the product and the process will be unveiled at the SOLIDWORKS 2018 launch. I remember in 2001 when we launched SOLIDWORKS Simulation, in some corners of the industry the feedback was, “If a designer who is not a FEA expert does simulation, they will create Frankensteins.” Obviously, that did not turn out to be the case. Most designs have a factor of safety and are small deformations. Also many designers have innate knowledge of their product and the proverbial ‘grease up their elbows,’ so they can easily interpret simulation results. 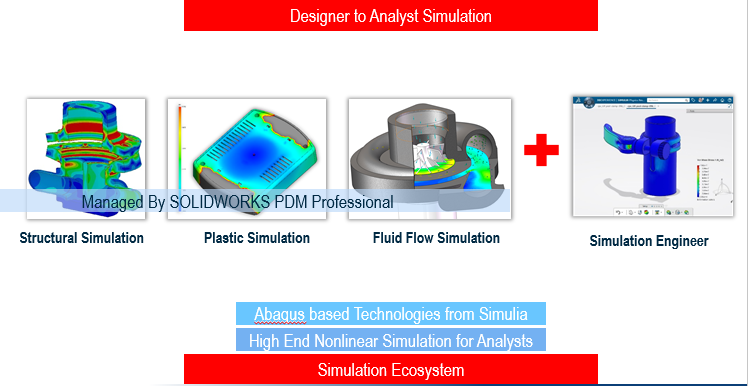 SOLIDWORKS Simulation solutions cover a wide range from Structural Simulation, Fluid Flow Simulation and Plastic Injection molding simulation that are easy to use and can solve complex problems. Also upcoming in SOLIDWORKS 2018 is Simulation Engineer from SIMULIA and a process called ‘Designer to Analyst Simulation.’ SIMULIA is a sister brand of SOLIDWORKS inside Dassault Systemes and has very high-end simulation products for Analysts and Researchers. Simulation Engineer is based on Abaqus technologies, which delivers best-in-class nonlinear solvers. Our customers now can scale from SOLIDWORKS Simulation to Simulation Engineer with one click. 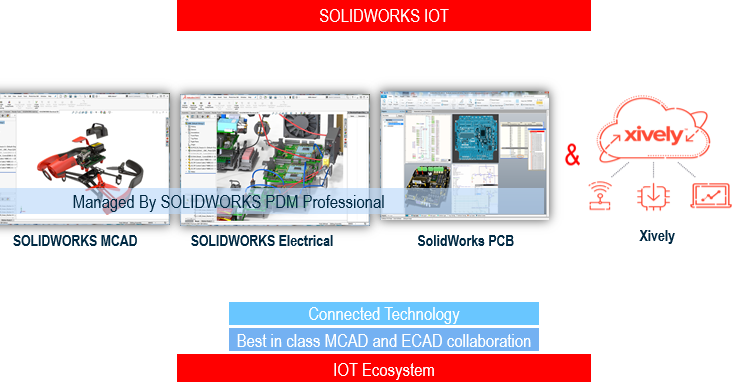 SOLIDWORKS has best-in-class MCAD products and we moved into ECAD as customers were telling us that many of their products in the future will be connected and managed through the IOT infrastructure. We launched SOLIDWORKS Electrical with thousands of customers using the product. Last year we launched SOLIDWORKS PCB, for Printed Circuit Board design. We’ve also partnered with Xively for the runtime management of IOT design. SOLIDWORKS customers can design MCAD and ECAD with the disruptive innovations delivered with SOLIDWORKS and deliver runtime management of their devices with Xively. Several customers like Freight Farms are very successful in implementing this approach. With SOLIDWORKS ecosystems of ‘Design to Manufacturing,’ ‘Data Management,’ ‘Designer to Analyst Simulation’ and ‘IOT,’ customers can innovate and scale with industry-leading products and processes. Please let us know if you want more information your reseller partner and SOLIDWORKS team is ready to assist you in your journey. Kishore is the SOLIDWORKS Brand UX leader and and the Product Portfolio Management Senior Director.